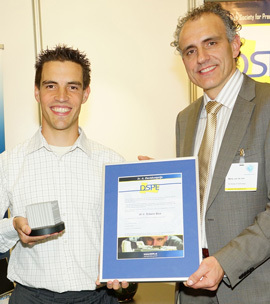 During the 11th 'Precision fair' in Veldhoven, the Netherlands, the Dutch Society for Precision Engineering (DSPE) awarded the ir. A. Davidson award to dr.ir. Edwin Bos, co-founder and managing director of Xpress. The jury was enthusiastic about his clever approach to precision mechatronics and his enthusiasm for the field. The ir. A. Davidson award is awarded every other year and serves to stimulate young talented mechatronical designers. The award is intended for a young precision technologist with several years of working experience in industry who has accomplished outstanding work in precision mechatronics, the results of which are acknowledged both inside and outside of the organization. Furthermore, his enthusiasm for the field should have a positive appeal to young precision engineers. The award is named after a key figure in Dutch precision technology history. Ir. A. Davidson wrote a series of books during his work at Philips in the 1950's and 1960's that laid the foundation for Philips's precision engineering community.